Everytime I receive a package from Skin18.com it gets me into a skincare addict mode. Not that I don't take care of my skin other days but I get a feeling of doing something magical to my skin with the Korean skincare products. Few days back I received the third package from Skin18.com as a part of Reviewer program. This time there are a variety of products and am excited to try and review them. 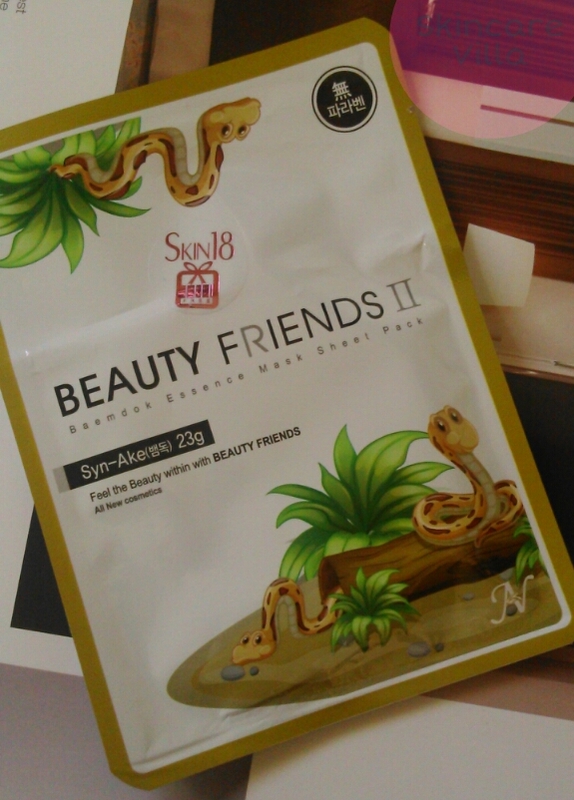 So here goes the first review of Beauty Friends II Essence Mask Sheet Pack (Syn-Ake). Basically this product has 21 variants and am reviewing the Syn-Ake variant. Syn-Ake - The Syn-Ake component it contains delivers elasticity and nutrition to your skin and keeps your skin that easily gets rough always bright and smooth. Feel the Beauty within with BEAUTY FRIENDS (All with natural ingredient!!) Each type includes various kinds of minerals and vitamins that help to rejuvenate sensitive skin while it cleans and moisturizes. As mentioned time and again all the masks are of quite good fit with a few folds. The mask contains Syn-Ake component which is majorly aimed at tightening the skin (based on my experience and previous skin18.com mask reviews). After keeping about 15 minutes, I removed the mask and dabbed all the essence left in the mask by squeezing it a bit. I let the essence dry up without rinsing. After about 1 hour I rinsed my face and dabbed dry. The essence has a subtle floral fragrance which doesn't linger much. The essence is transparent, jelly like and sufficient in quantity. I was left with a smooth, plump and hydrated skin. It didn't break me out, rather it reduced the redness which I have on my forehead. The skin gets a smooth finish and I didn't feel the need to moisturize my skin. However I also had a stretchy feeling after the essence dried up, but since I don't have fine lines I didn't bother for the effects. Overall the mask is a good option to try out while travelling or when we need some me time, nutrients for the skin. However one mask is not going to show the effects intended and around 3-4 masks per week are recommended to use. Price, shelf life and availability - $0.95 for one mask sheet with a shelf life of 2 years. I would recommend the mask for it's moisturizing effects. It is a good option to try out during travelling or when we are in hurry or have a hectic schedule. 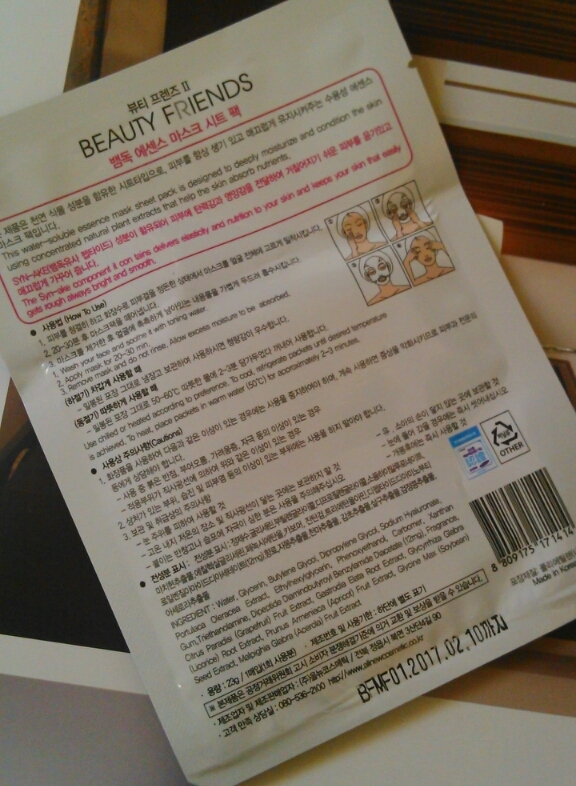 But these masks need to be used often to see the miraculous effects of Korean skincare. However this mask didn't disappoint me.